Originally published in Amateur Cine World September-November, 1942. Copyright H.A.V. Bulleid. All rights reserved. Reprinted by permission. Distributors . . . . . . . . . . . . . . . . . . . . . . . . . . . Phillips Film Co.
Sub-standard availability - Pathescope Library, 3 notched reels of 9mm, equivalent to 2,600 feet of 35mm. British Film Institute Library, full version on 6 reels of 16mm. a critical commentary by H.A.V. Bulleid, M.A. 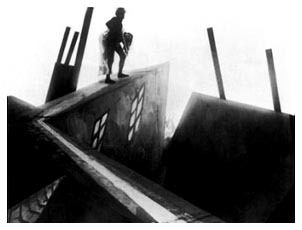 "Caligari" is one of those films about which screeds have been written: on the sociological aspect, naming it a macabre, introspective drama produced by a defeated race: on the commercial aspect, quoting its real and imagined effects upon contemporary cinema technique: and on the artistic aspect, with references to painting, pure pictorials, influence of theatre, etc., etc. . . . The first does not concern us here, though we might mention the macabre "Jekyll and Hyde" with John Barrymore, produced in 1920, as an example of the macabre from an undefeated race! The second needs exploding. "Caligari," due to a certain coolness between this country and Germany after the war, only arrived here late in 1923. Its effect on American films was nil: and naturally because "Caligari" is a study in unreality whereas the Americans made a God of realism: and, anyway, they didn't need teaching anything about cinematography. They already had, by 1919, used all the purely technical devices credited to the Germans, and as for psychological interpretations or experiments with design and action to make pictorial compositions, they simply were not interested. The public paid for realism hooked on to hokum stories, and films were manufactured accordingly. Precisely the same is true today: "Citizen Kane" drew less than a Melvyn Douglas frolic. The brief treatment is as follows . . . Seated in a bleak garden, Francis recounts his story to his companion: A doctor Caligari seeks permission to show his somnambulist Cesare at Holstenwal Fair -- but is rebuffed by the Town Clerk, who is murdered that same night. Francis and his friend Alan visit the Fair, and Cesare foretells that Alan will be dead by dawn. They proceed home, vowing friendship no matter which one their idol, Jane Olsen, should choose for a husband. That night Alan is murdered. Next day Francis and Jane's father, the doctor, call on Caligari and find him feeding Cesare: meanwhile another murder is attempted and a man seized who is suspected of all three murders, though he strongly denies the first two. 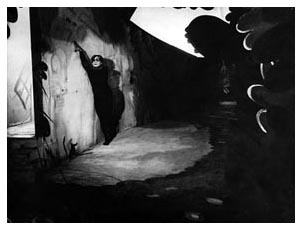 Jane, in search of Francis and her father, visits Caligari and is shown Cesare and runs away in terror: that night Cesare enters her room and abducts her, but after a chase she is found, and on recovery accuses Cesare. Accordingly, Francis visits Caligari with the police, and they now find a dummy in place of Cesare. Caligari gets away and proceeds to a Nursing Home, trailed by Francis. Inside, Francis and some of the Staff search the papers of the Principal, Dr. Sonnow, and find a diary relating how he became Caligari and experimented with a somnambulist. Then Cesare is found and brought in; and, faced with this evidence, Dr. Sonnow becomes violent and is straight-jacketed and put into a cell. Francis finishes recounting this tale to his companion in the bleak garden, and they enter the house to rejoin their guests: and now we see them in the main hall of the Nursing Home, and it is plainly a lunatic asylum. Jane is there as a Queen and pathetically refuses Francis's repeated proposal. Then Dr. Sonnow enters, and Francis rushes wildly at him, so is seized by attendants and taken to a cell; and the doctor says he understands his madness and can cure him. It will be seen that the main body of the film is constructed in the form of a flash-back relating the story imagined by Francis, in which respect the film is similar to "Vaudeville" - though in the present case more dramatic value is obtained at the end of the flash-back due to the emotional impact on the audience at the realization that Francis is a lunatic who has built up the tale around the (dreaded) Principal, the (weird) unfortunate Cesare, and the (aloof) beautiful Jane. Compare "Körkarlen" (1920, by Victor Sjöstrom) wherein a similar dramatic impact occurred at the climax of each of two flash-backs. The film fades-in with a drab long shot of the neglected garden, Francis and his companion being seated near the camera. Jane approaches, and iris-circled close-ups of Francis are cut in. He watches her intently as she passes aloofly by. Then in CM.S, he recalls the terrible adventure that befell them . . .
An expanding diamond iris-in shows the weird little town from the fair-ground; then another L.S. street scene shows Alan reading a bill; cut to L.S. interior: Francis reading in his room, Alan bursts in and asks him to come to the Fair. The impact of these weird sets coming so quickly is too much to assimilate, and in fact the 9mm version has here been excessively pruned. In the 16mm version, the introduction is well done, single-word titles being employed with appropriate eccentricity. The next shot is of an Office corridor, and Caligari requests to see the Town Clerk, introducing himself by card (close-up inserted). He is taken in, and the Clerk, seated on an impossibly high stool, curtly bids him wait. 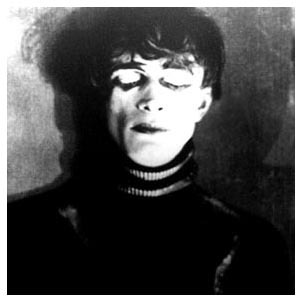 Caligari glowers in a lengthy iris-masked close-up, then sets up -- and is again told to wait. Then the Clerk descends and turns Caligari over to another official . . . slow oval iris-out. Two lengthy long shots establish the Fair in full swing; then in CM.S. Caligari rings up an audience outside his tent and unfurls a full-size canvas of his somnambulist; the sequence closing on a covering long shot. A title baldly announces the murder of the Town Clerk, and then an eccentric iris-in reveals a superb long shot, exquisitely composed and horribly sinister, of a disordered bedroom with broken panes in the fantastically shaped window. Another eccentric iris-in reveals (after delayed opening) Francis and Alan at the Fair. Caligari is about to display Cesare. A finely filled mid-shot of the crowd looking up at Caligari, with excellent types, includes the pair. Long shot then mid-shot, beautifully arranged in terms of high-light and shadow, show Caligari with his coffin-shaped cabinet. His angular gestures match the sharp-cornered set design and the high dramatic pitch of the sequence. He opens one half of the cabinet, then the other, revealing the macabre, black figure of Cesare. a. C.S. - (oval mask) Caligari looks sideways at Cesare, 50 frames. b. CM.S. - Caligari speaks to the immobile Cesare. 90 frames. c. C. S. - (circular mask) Cesare, motionless, 92 frames. d. C.S. - (oval mask) Caligari says . . . , 35 frames. e. TITLE "Cesare, I am your master. Wake up and walk." f. C.S. - (circular mask) very slowly Cesare opens his eyes, 295 frames. g. L.S. - (low angle) . . . and walks stiffly forward, 586 frames. h. M.S. - (high angle) Francis and Alan, -- predominant in the crowd, look on spellbound, 78 frames.
. . . then Alan asks his fortune and is told he will be dead at dawn. This is indeed an eerie sequence, and cinematic means have been properly used in heightening the effect and adding suspense. Caligari is masked in a vertical oval for shots a and d, which heightens the emphasis while retaining the full effect of his top hat. Cesare, starkly horrible, with tousled hair, is ringed by a diffused circle in shots c and f. f runs over 18 seconds, Cesare's staring eyes riveting the attention. Shots g and h are admirably contrasted in angle and lighting. Alan, in close-up against dead black, laughs hysterically. They leave, and in long shot in the town (anther exquisitely perfect set, with its strange street lamps, queer patches of shadow, mis-shapen buildings, odd windows and fanciful water-pump) see a notice stating the infallibility of Cesare's forecasts. Then Jane approaches and they talk animatedly. A cut-in long shot shows Caligari entering his caravan. In mid and long shots Francis and Alan swear friendship whichever Jane chooses. A sinister shadow on the bedroom wall, Alan's staring terror, two outstretched hands, the shadow of a thin dagger, and a lunge forward as the shot fades out -- so, admirably, is the murder portrayed. The news is brought to Francis in a long shot that is theatrical and over-acted, and reminiscent of a 1912 D.W. Griffith Biograph one-reeler. One long shot shows Alan's room as Francis comes. The window is horribly broken. In the garden of Jane's house -- another memorable set, foliage and flowers being most remarkably represented -- Francis breaks the news: again theatricalism has crept in, over-lengthy long and mid-shots covering the action and inviting the inevitable over-acting. At this point, in addition to the abridgement, the order of scenes in the 9mm version differs slightly from the original, and the scenes of Francis going to the police are cut: but the loss is not serious. It has to be established that Francis and Dr. Olsen are with Caligari while another murder is committed, and this point was rather laboured in the original. In the 9mm version we have a shot of Cesare being fed in his cabinet in Caligari's caravan: Francis and the Doctor call and enter: a sinister figure enters a house, iris-out: in long shot with screen blank except for small iris circle in top left hand corner a woman screams for help: close-up emphasises: in long shots the murderer runs out, but police come from all directions and seize him. He is taken to the police station (again Officialdom sits on a very high stool!) and accused energetically: a close-up panning shot with horizontal oval mask indicates the vociferous police. Meanwhile, in the caravan, Dr. Olsen asks Caligari to awaken Cesare, but is ignored. A messenger hands Francis a sheet stating that the man responsible for the recent two murders has been taken whilst attempting a third. They proceed to the police station where the man strongly denies implication in the previous two: the long shot closes with eccentric iris-out on Francis at one side of the frame, and he is sorely puzzled. 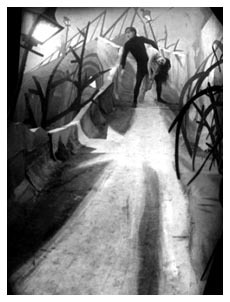 Meanwhile Jane visits Caligari in search of her father, is shown Cesare, whose eyes open and stare burningly at her, and she runs away in terror. Then comes one of the finest sequences in the film . . .
a. TITLE - Late that evening. b. L.S. - Jane, sleeping in a huge bedroom. c. L.S. - Cesare walks along beside the wall of their garden, a spine-chilling black figure of uncanny height. d. L.S. - (as b) Cesare appears in background outside the window . . .
e. M.S. - (diamond mask) . . . breaks window and enters . . .
f. LS. - (as d) . . . walks up to bed . . .
g. C.S. - (masked for black background) . . . stands with dagger poised . . .
i. C.S. - (as g) He looks down. j. L.S. - (as h) He moves to touch her, but with a scream she awakens. k. C.S. - (circular mask) He struggles with her. l. L.S. - (as j) He struggles with her. m. C.M.S. - (circular mask) The same. She screams for help. n. L.S. - (as l) He seizes her and lifts her up. o. LS. - (fringed) Two members of the household awaken. p. L.S. - (as n) He carries her away with trailing bedclothes through the window. The construction of the above approaches perfection, and for 1919 is quite remarkable, being on a plane with the best of D.W. Griffith's cutting. The only continuity error occurs between shots d and e. It will be noted that the editing plan is based on the main long shot, that is shot b, which is identical in set-up with d, f, h, j, l, n and p. The gleaming dagger blade in shot g is memorable (and fixes the guilt of the Town Clerk murder, which we saw in shadow). Shot k is filled with deathly fear; black and white struggle in a turbulent composition. Shot o provides a wisp of comic relief. Shot p, with the trailing white is impressive. The sight of the broken window is somehow horribly suggestive of inescapable death. Shots of Francis spying on Caligari, who can be seen sitting beside Cesare, are cut in. Then in a thrilling long shot, fringed with an irregular oval, Cesare walks on nightmare roof-tops carrying Jane. He is chased and drops her. Getting away, he collapses in a deathly ravine. A long shot of Francis and her father with Jane mixes to mid-shot of the same. She accuses the somnambulist. Francis hurries away. Iris-out closes on Jane. An eccentric iris-in (misused on this occasion) opens a L.S. of the police station. Francis asks the police to come again to Caligari. They are refused entry, but break in and carry out the cabinet, and they find that the Cesare lying in it is a dummy: Caligari gets away. 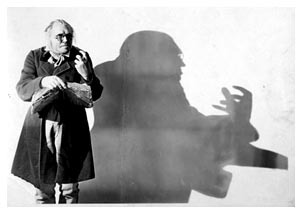 Francis trails Caligari up to a door bearing the inset legend: Nursing Home: Doctor Sonnow (16mm version gives Lunatic Asylum). In the main hall he enquires after a patient named Caligari and is taken to the Principal. The design of the main hall is a fine achievement. Whilst it lacks positive distortion as applied to all the other settings of Francis's tale, it is nonetheless sufficiently angular and ominous to take its place without breaking the continuity of the design. The forbidding door of Dr. Sonnow's room is shut behind Francis, and we look down a long narrow room of fantastic shape and disorder. Then in close-up the doctor raises his head and we recognize Caligari. Francis dashes from the room, down the corridor, back into the main hall, where he collapses into a chair and tells a group of attendants what he knows. And that night they search the doctor's books: a mix to the action described in the diary is well achieved by a double eccentric iris; the mid-shot of the readers irises out in the bottom left hand corner while the succeeding long shot of the doctor at the desk opens in the top right hand corner. A somnambulist is brought in, and the doctor goes into raptures over him. The same double iris method is used as Francis turns to another page in the diary. Continuing the flash-back, the doctor in frenzy declares he must become "Caligari." In a remarkable shot in the garden, carrying aloft a book, the doctor cries out while the legends appear across the frame (done cartoon-fashion) appearing letter by letter, "du Caligari" . . . and "du musst Caligari werden" ("You must become Caligari.") A ludicrously incongruous expanding title has been casually added to the 9mm version. As Francis and the others finish reading, news is brought in that Cesare has been found. Accordingly he is brought in to the doctor who first leans sadly over him, then wildly attacks the nearest man. He is put in a straight-jacket and, in a final long shot, led struggling into a cell whose walls are covered with a horribly livid design suggesting a malignant fungus: A cut-in close-up shows his writhing movements on a mattress under this nightmare pattern. The long shot ends and ends Francis's story with an iris-out on Francis looking at the massive door with its weird scrolls, which has shut out this Dr. Sonnow who masqueraded as Caligari. A slow iris-in on Francis and his companion in the bleak garden recalls the set-up of the first shot in the film. Francis adds that the madman has never left his cell. His companion complains of the cold, and suggests they return to his guests. They move away; cut to long shot of the main hall of the Nursing Home. But now it is filled with people: there is Jane, picked out in fringed medium close-up, sitting regally aloof; she looks round at Cesare, standing child-like nearby. A bearded man is talking aloud with passionate gestures. A woman plays a non-existent piano. Francis and his companion enter. Francis points out Cesare (the frame is masked to a thin vertical strip for the detail mid-shot) and then, on tenderly approaching his beloved Jane, receives her sad reply: "Alas! Queens such as I have no right to choose according to the dictates of our hearts." Then in long shot Dr. Sonnow enters, and in two cut-in close-ups we realize just how Francis's warped mind has conjured up the evil Caligari from the features of the kindly Dr. Sonnow. Francis shouts: "You all think I'm mad! It's not true! It's the Doctor who is mad!" -- and rushes at the doctor, and attendants appear with straight-jacket, and he is led away into a cell identical with that shown at the end of his own story except that the walls are free of the evil pattern. And the doctor bends over him, then straightens up, and says: "I understand his madness. He thinks I am Caligari. I will cure him." The shot ends with a delayed iris-out on the thoughtful and kindly face of the doctor. The production is undoubtedly one of extraordinary imagination, and of very considerable interest if not one that is likely to make a wide popular appeal. 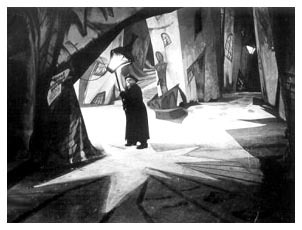 In "History of the Film" one reads: "'Caligari' seems to mark one of the extreme limits of cinematography, a point where it merges with painting itself . . ."
Scenario. This is a well-knit and workmanlike job without special inspiration. The material of the story is well arranged. Direction. Robert Wiene was undoubtedly inspired. He failed to repeat his success in 1923 with "Raskolnikov" (Crime and Punishment), but made a good straight-forward thriller in 1924 with Conrad Veidt, "The Hands of Orlac." "Caligari" was his flash of genius in which he completely achieved cinematic fame. Acting. The success of this phase has been noted earlier. The supporting players have obviously taken detailed instruction from the director, who probably collaborated with Krauss in working out his arrangements. Krauss differentiates between Caligari and Sonnow with easy assurance, but with confidently contrasted gestures; Caligari jerks, Sonnow flows. In make-up, too, Caligari has lines, points, corners, whereas Sonnow has curves. Veidt manages to put more than a trace of pathos in his character of the helpless somnambulist. 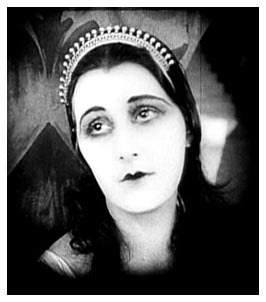 Wisely, Lil Dagover's part was kept small; she succeeds most in the tragic epilogue with her pathetic, regal delusion. All the players are remarkably successful in looking as though they belong in their extraordinary surroundings. Photography. The photography is quite objective and sharply focused from foreground to background throughout. A wide-angle lens was used for all the long-shots -- a device revived in "Citizen Kane" (RKO Radio Pictures, 1941, by Orson Welles with Welles and the Mercury Players). A stationary camera permitted proper pictorial compositions. The one panning shot is a close-up. Masking is extensively used, in some cases to assist the composition. The eccentric iris-fades are effective: This fashion reached its peak about 1920 but died later. It is due for revival, perhaps as a much-heralded discovery. Montage. This phase is the least effective, and its possibilities obviously were beyond the grasp of the director. However, the cutting is free from errors and is fairly concise. An example of the effective inclusion of a lengthy shot for emphasis is given above. Design. This is clearly the feature of the production. The enthusiasm which must have existed in the studio for these amazing creations appears to have been a force binding the production phases into their solidity of achievement. There is more in these designs than meets the lay eye. Symbols of the German expressionists apparently add to the weird subjective power of this brilliantly reproduced madness. The chief tribute to the cameraman is that he has lit these queer sets without covering them with shadows that would have ruined the illusion. Titles. The wording depends on different translators for the 9mm and 16mm versions. About the wording, there is no point of special note, but a moment's thought will suggest that to set them in ordinary type is wrong: and in fact the original German and French versions had the titles written in uneven, distorted, angular characters on a broken background: the effect was amazingly powerful. The same applied to the inserted close-ups of notices. General. The original was tinted: blue for night scenes and some parts amber. The photographic quality of the available version tends to soot-and-whitewash to a degree in excess of that in the original. So popularly successful was the film in France that it was continually being revived, either wholly or in part. The present writer saw the first part, up to Cesare's fall into the ravine, at Studio 28, Paris, in August 1938, the print shown being practically new. "Caligari" is indeed a memorable masterpiece. The horrors of Francis's grim tale rise in crescendo, only to be capped by the realization that it is a madman's horrible delusion. Except possibly at the first close-up of Cesare and the over-acted long-shots remarked upon above, the film is completely free from unintentional comedy -- rare in a 23-year old drama. This is a film of which fragments linger in one's memory to an unusual degree: the sinister, unkempt garden; Caligari's black and menacing figure; Cesare stealing along the wall of Jane's garden; the unnaturally broken windows; the roof-tops; and then the pictures from the diary, the indescribably horrible madman's cell, and the hall of the asylum, full of dread implication. "Caligari" points along a Cinema by-way still unexplored. It stands some way along a turning which every other director has passed by. Its unreality is tonic; it unusual elements, fascinating. It stands very high in the list of Famous Films, and is undoubtedly one of Cinema's outstanding additions to modern art.